Offering an entire wall of windows in the living room that look out over the center courtyard and a unique built-in bookshelf, the Dietrich floor plan also offers a “loft-like” feel in this layout and the bedroom with the most privacy. You and your guests can flow easily between the living room and kitchen since the hardwood floors run throughout and this is the only floor plan where the two rooms are connected. The kitchen, bath, and bedroom windows look out onto the tall trees that line the side of the building for a lush green view from every window. In the kitchen you’ll find a breakfast nook and small bar cabinet with glass doors. A small hallway nook guides you to both the bath and bedroom and includes a linen closet for added storage. 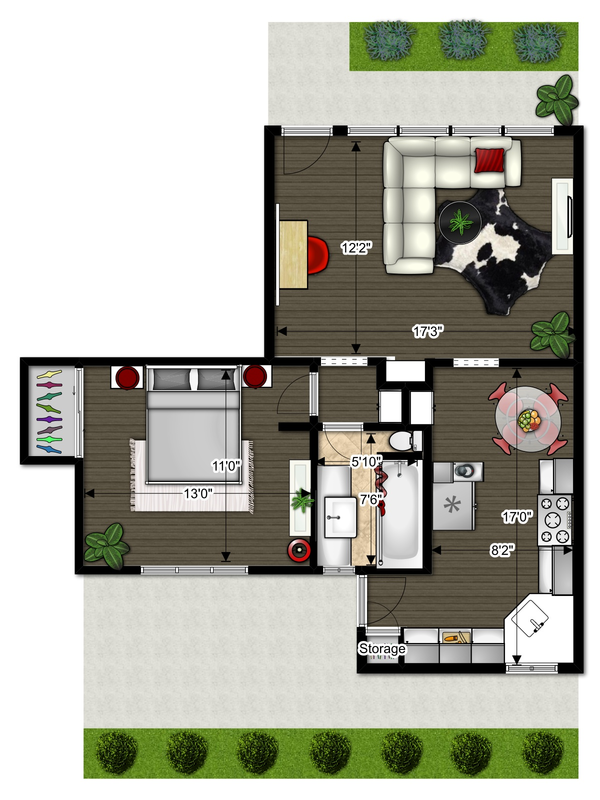 The bedroom in this floor plan is very large and is the only bedroom that is situated on the side of the building – allowing for the most privacy and a quiet retreat.